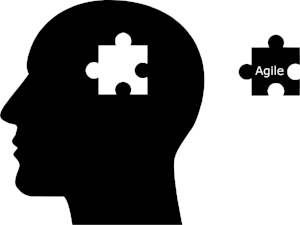 Developing an application is the part that takes all the interest from any developer; I mean, the name kind of implies that right?. However, a complete development process does not finish when the team write the last line of code, we still have to make the deployment. During most of the process, we can use simpler configurations. For example, we can use the default links provided when we host in a S3 bucket, if we are using an EC2 instance we can use the direct IP, or even use a load balancer that points to a set of Docker instances. However, in all of these cases, the URLs are not friendly since they are autogenerated by Amazon. S3 bucket: where the application code will be hosted. We won’t run through this during this post, but you can check my Amplify posts to see how to do it. As a prerequisite for this part, we will need to create a hosted zone in Route 53 where the certificate will be associated. For that, go to the Route 53 service, in the left menu select hosted zones, and create one if you don’t have already. The first step that we will cover is requesting the SSL certificate. For this, we will go to the Certificate Manager service in Amazon and click on “Request a Certificate” and select a public certificate. The next step will ask us to register all the domain names that we want the certificate to be used for. Important: we can use a wildcard to use multiple subdomains. For example, you can type *.mydomain.com, and it will cover cases like admin.mydomain.com. After setting the domain names, it will ask us to select the verification method of the certificate. 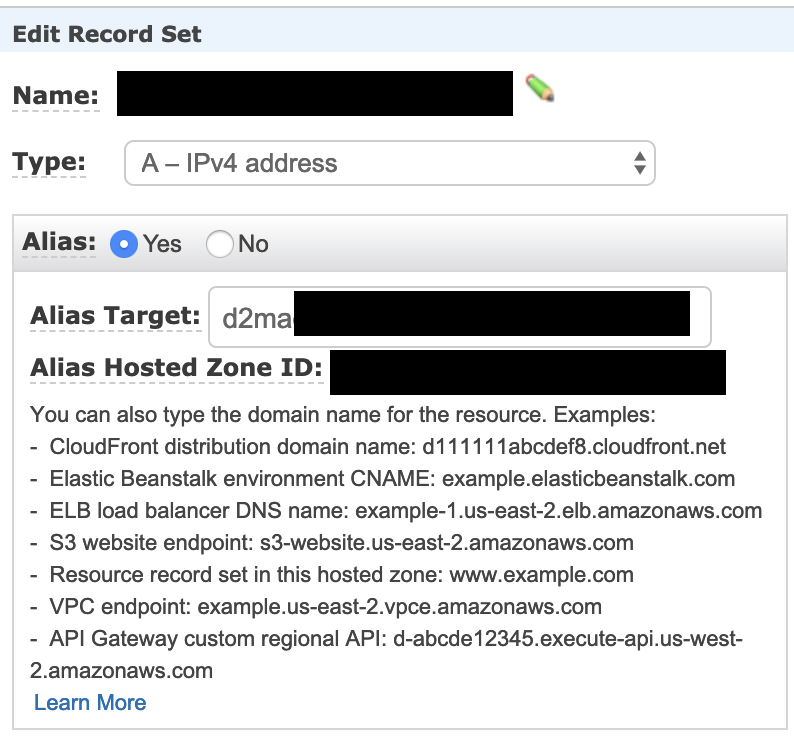 Since we are going to use only Amazon services, let’s select DNS validation. Finally, we will review all the selections and continue with the wizard. 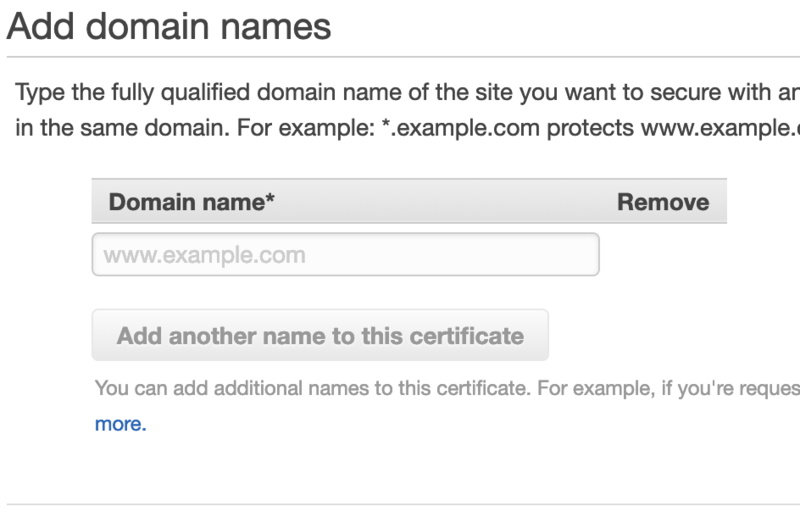 After the request has been created, we need to validate and create the domain for the certificate in Route 53, however, this is an automated step that the Certificate Manager can do. 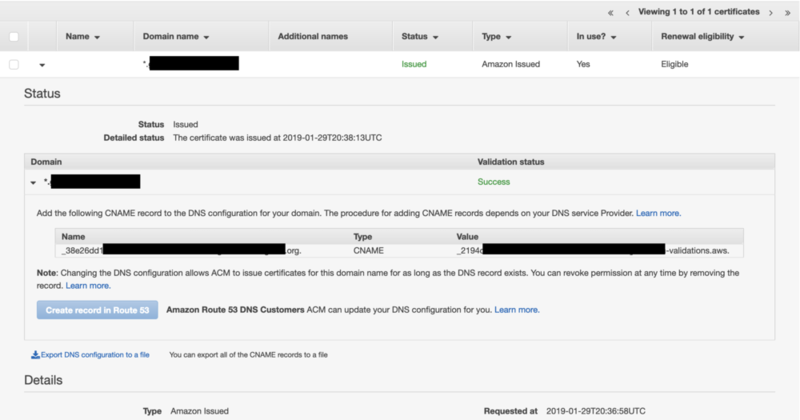 In the dashboard for the certificate manager, you will see the certificate that you just created, and inside of it, it will prompt you to create the DNS records in Route 53. Now that we have our certificate set up and ready to be used, we need to create the cloud front distribution that will point to our S3 bucket. For that, we will go to the Cloud front service dashboard and click on “Create distribution”. For our use case, we will select “Web” as the delivery method (this is the first screen that will show). From there, we will be presented a big form with a lot of options, but for most of them we will leave the default values except in 3 specific areas. First, we need to select the S3 bucket where the application is hosted as the “Origin Domain Name” (this field is a dropdown, even though it doesn’t look like it). The second change that we will make to the form is under the “Default Cache Behavior Settings” section. In there, we will select “Redirect HTTP to HTTPS” in the viewer protocol policy option. This will automatically redirect the user to the HTTPS site, even if they don’t specify it in the address bar. Finally, under the “Distribution Settings” section, we will select the certificate created previously. After all of that, click on “Create Distribution" button at the end of the screen and wait some time while Amazon provision all the resources for it. Important: when you are using React or Angular applications, we need to set the default root object to be the index.html file. For that, in the same form, a couple of fields after selecting the certificate, it can be specified. If you didn’t set it up the first time, you can modify the distribution after its creation. Previously, we used briefly Route53 to validate the certificate request, however this time we will create the real URL that our application will use. So, we go to the Route53 service in amazon and in the left bar menu click on Hosted zones. From the hosted zone that you created before, we will add a new record set. If all the previous steps were executed successfully, there should already be one record set for the SSL certificate. In the new record set, we will type the name of the URL that we want to use, for example: admin.mydomain.com, set the record set to be an alias and from the input that will appear, select the cloudfront distribution created earlier. After finishing creating it, we will need to wait some time while Amazon register the domain in the DNS servers and propagates the changes. Shortly after, you will be able to use your new URL to access your website. Bonus track: what about APIs? Now that all sections have been covered, I hope that your application has been deployed successfully, and your customers will be happy by having a pretty URL that is easy to remember (hopefully). If you have any comment, don't hesitate in contacting me or leaving a comment below. And remember to follow me on twitter to get updated on every new post. A couple of weeks ago, I was trying to deploy a small service, but I didn’t wanted to start creating the full infrastructure suite on Fargate yet; hence, the best option is Elastic Beanstalk. For a couple of days I did the deployment manually, but after reading a little bit more about Beanstalk, I found a CLI that simplified a lot of the deployment process. Here is some documentation if you want to read about it, but for the mean time, I will write a little bit about how I used it. It might be useful to you, if like me, you are looking for ways to do a quick deployment and don’t want to invest time in configuring the CI/CD pipeline or a more complex setup. To install the CLI, there are two approaches, using HomeBrew or the other one using PIP. In my case, I used Brew because it’s so much simpler (and also because the other way failed for me :). I’m going to assume you are already using AWS profiles in your machine, if not, I recommend reading about them here. Elastic Beanstalk Application: it will prompt you create a new app if none is already created. Keypair: to connect to the instance, you will need a key pair to use via SSH. The CLI will help you to create one as well. Important: there is a step asking you if you want to use CodeCommit, this will help you create a pipeline, however, since we are using other source control tools, we ignored it. Once the CLI finishes, you will see a new folder in your project called: .elasticbeanstalk (notice the dot at the beginning). If you wanna read more about configuration options, go here and here. We used DEV, and after it finishes, we need to update some configuration in the AWS console. We will update the node command, this command is the one nginx will use whenever a new deployment is done. Important: I had an issue, a really weird one when I started doing changes and deploying them, and it seemed like the deployment never grabbed the latest changes. After reading in internet for some time, I found this post; and in one of his IMPORTANT notes, Jared mentioned that the changes must be committed to Git for them to be deployed. I don’t have the answer to why this happens, but seems important to note. Using typescript, the deployment is not as straightforward, so we need to add one more step to our config.yml file and in the package.json. Important: these steps are necessary because Elastic Beanstalk do not install dev dependencies in their machines, so we need to overcome that issue with this new process. Now, let’s explain a little bit about what we are doing. The scripts in the package.json file were updated to run the shell script after the compilation is finished. The shell file grabs everything that was compiled and move it into a zip file. Next, in the config.yml, we specify the file that we will deploying to the environment in Elastic Beanstalk. So, the ebcli will only grab the zip file and send it. Under the hoods, elastic beanstalk will unzip it and run the command specified in the beanstalk environment. Finally, run again the eb deploy command, and now our Typescript Express API will run in the cloud. Now that all sections have been covered, I hope that the application has been a success and you have deployed your app into the cloud. If you have any comment, don't hesitate in contacting me or leaving a comment below. And remember to follow me on twitter to get updated on every new post. Authentication using AWS is a process I covered in a previous post, however, this time we are going to use a tool provided by Amazon called Amplify. For this tutorial, we are going to create a simple application using Facebook’s create-react-app. Then, we will add the authentication layer by using AWS-amplify, and finally, add the hosting in S3 buckets. But before that, let’s provide some basic concepts. What is create-react-app and how to install it? 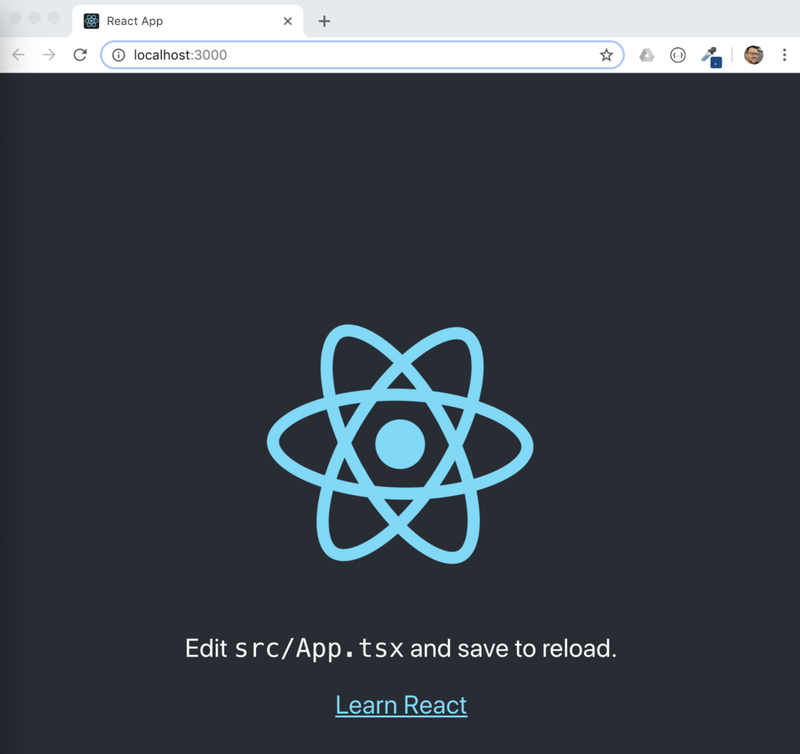 Create-react-app is the best tool to use whenever you want to start creating a web application with React, and for someone like me that likes Typescript, it has now the built-in capability to create apps using it. Installing it into your machine is like installing any global package from npm. Just type “npm install -g create-react-app“ and voliá! There are some dependencies needed although, for example, you must have at least node version 6. This library also allows you to focus on creating your application instead of dealing with webpack or babel configuration. Now, let’s start with the real deal, and work on our Google authenticated application. To create the app, we will run the following line in your preferred terminal: “create-react-app google-auth-tuto --typescript“. This will generate all the necessary code you need to start working. To start using the application, run “npm install” in your terminal to verify that you have all the necessary packages installed. 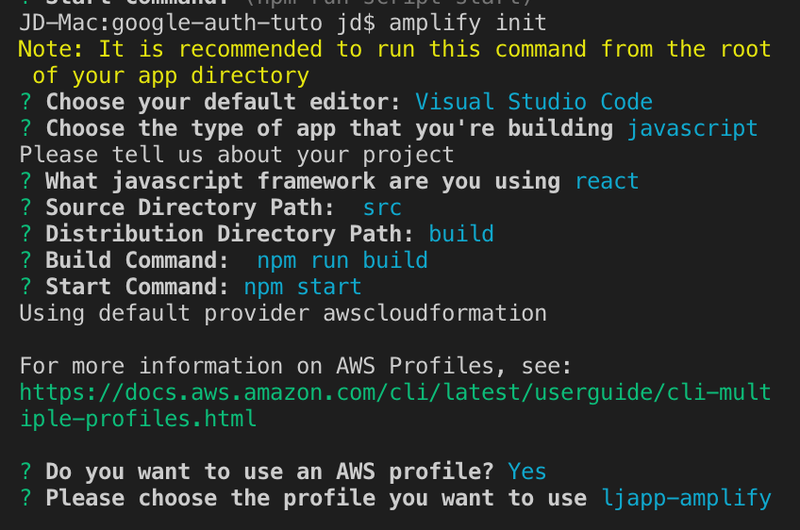 Then, in the package.json file generated, some scripts have been created by default, this time we will use the “start” script; so simply run “npm start” and it will open a tab in your browser after the application finishes compiling your code. Now that our application is running, we can start using AWS-amplify to add some cloud functions, but first, we will need to configure amplify in your machine. For that, you can follow the next video that explains how to do it (taken from aws-amplify main site). Now that amplify is configured in your machine, we can add it to our application by running: “amplify init” in your project root folder. It will prompt you several questions and after them it will start creating some resources in your account, here is an example of what you will see in your terminal. At the end, if this is the first time you are running aws-amplify, it will create a new profile instead of using an existing one. In this example, I’ve used my profile named ljapp-amplify, so this section might be different for you. Important: always create different profiles for your AWS accounts, in my case, I have to use multiple accounts for my companies’ clients, so it facilitates a lot my work. After the AWS resources have been created, let’s add the authentication layer to our app. AWS-amplify have different categories of resources, authentication is one of them. So, let’s add it by running: “amplify auth add“. Same as before, you will see some configurations asked by amplify, here is a summary of what you will receive. The only information that you might be wondering how to get is the Google Web Client Id. For that, please follow the instructions found here, under the “Create a client ID and client secret” section. Finally, run “amplify push” and this will start creating all the authentication resources in your account. Important: AWS-amplify uses Identity Pools for 3rd party integration instead of user pools. Since identity pools doesn’t manage groups, we can only authenticate them. So, if we need to provide specific permissions or roles, we need to use claims (or switch to user pools manually) and configure it manually in AWS console. Then, we will modify our App.ts file with the following code. The second parameter in the “withAuthenticator” high-order component, will create a header for our application with some minimal information like the name of the user logged in, and also, renders the log out button. Important: By default, aws-amplify provides some default screens that can be customized, but also, it allows for creating our own components for login, register, among others. This will not be covered in today’s tutorial and we will be using the default screens. Now that everything is set, we can run our application again and we will be seeing the following screen. And then, we can log in using google’s button and after verifying our account, we will get into the application. Now that everything is setup, we can host our application in the cloud with amplify. For that, we will add the hosting feature by running the next command: “amplify hosting add“, and same as before, some configuration is required. Shortly, it will ask you to run amplify publish, and this will create the S3 bucket if it doesn’t exist, and open right away a browser tab with the application hosted on that bucket. Now that all sections have been covered, I hope that the application has been a success and you have created a React application that can use google authentication, and hosted easily in S3 buckets in AWS. In an upcoming tutorial, I will talk about using Cognito User Pools to do 3rd party authentication. Do you have a requirement that you need to run some kind of process every X number of hours? Wondering on creating scheduled jobs in Node? If that’s why you are here, then this post will work for you. A cron expression is a string containing some subexpressions that describe the details of the schedule that you want to create. Every subexpression is separated by a white space and have a limited amount of options to be set. The cron expression is defined from left to right, and it can contain from 5 to 7 subexpressions (fields from now on). The first option is to set a scheduler with seconds. This field is optional and is only used when the cron expression has 6 fields. It accepts values from 0 to 59, or the wildcard ( * ). The second option is used for minutes. It accepts values from 0 to 59, or the wildcard ( * ). Third for hours. It accepts values from 0 to 23, or the wildcard ( * ). Fourth for day of month. It accepts values from 1 to 31, or the wildcard ( * ). Fifth for month. It accepts values from 1 to 12, the names of the months, or the wildcard ( * ). Sixth and last for Day of week. It accepts values from 0 to 7, the name of each day, or the wildcard ( * ). As mentioned before, we are using node-cron. An NPM package with more than 50,000 downloads weekly, and currently, as the time of this post, on version 2.0.3. In Github, it has 713 stars, 10 contributors and 20 releases since February 2016, which was the first release. However, this example falls short if you work with a more real-life scenario; like retrieving information from a datasource, manipulate it and then insert it into another database. This is a typical case of a process that needs to be done when you are doing some kind of synchronization between two systems. And actually, today we are doing that same example. Our use case will be to retrieve information from a system called BambooHR (used to manage employees of a company, salaries, vacations, etc), compare it with data from another system and then insert, update or delete the differences. So let’s start first with the cron job. Let’s explain this class by sections. First, the constructor is where the task is going to be scheduled. The method schedule, imported from node-cron, receives 3 parameters: the cron expression that is being retrieved from the environment file, then the callback to the job code and lastly, some options of the scheduler (in out case, the only option we set is that it won’t start immediately). The method startJob is a simple one, since we specify that the job is not going to start as soon as we schedule it, we need to have a way to start it programmatically. The following method is executeCronJob, here is where everything happens, at least from a high level. From here, we initialize all the services that we are using to retrieve or insert information and also we print some information messages to the console like the time the task is running and when will be the next time the job runs. The next two methods are similar but works for different entities, so let’s explain the flow for each one. The first step is retrieve all the information needed by calling methods from the services instantiated in the executeCronJob method. Then, we compare the data using lodash’s differenceWith method (another famous package). And finally, from the arrays created, we either delete or add information to the database by calling the services again (no updates are being managed in this example). As I’m writing this post, I’m noticing that the methods processEmployees and processTimeOff are, in essence, the same thing. So they can be abstracted to another method that encompasses the implementations. Feel free to design it differently. Now, we are going to work with the service that retrieves information from bamboo. Again, let’s review this by sections. First, we create some reusable headers and a getBaseUrl method. This method will create the URL that will be used to connect to Bamboo; this URL is created by reading some configurations from an environment file. Then, we have two methods that get the information, one for the employees and another one for the time offs from Bamboo. Some logic is applied in here to limit the information retrieved, for example, for the time offs we just want to retrieve the requests created or updated for the upcoming 3 months, anything prior to that is not needed for our target system. From the BambooCron class, we also use services that connects to our database. In our system, we are using typeorm (which I talked previously here), an ORM with mysql integration and supports typescript out-of-the-box. For this post, I’m just going to show the service to manage users, however all of them follow a similar approach, so you can extrapolate for the rest of the entities. The DbContext class is a reduced version of the one I use, it has more entities but the rest of the design is the same. First, we have an init method that creates a connection every time the DbContext is instantiated, and this connection receives all the entities and database information needed to create it. And then, for every entity, we expose a getter property that expose the repository for each one of the entities that the typeorm will map to. Finally, we have arrived to the end, and if you are here also, it means that you have created all the necessary code to run a scheduled task using node-cron and typeorm. Now, this is just one of the many use cases that can be covered with this design, so please adapt it as best as you see fit to whatever case you have to solve.